How does Vastu work ? Is your name spelling lucky ? What are your lucky numbers ? How loving a husband/wife you are ? Year 2017 is governed by Number 10. Number 10 is ruled by the mighty Sun. Not only is Sun the mightiest among the nine planets but in Numerology too, we give it a lot of Significance. Among the nine single-digit numbers, the 1 takes a special place. From a spiritual perspective, it is the number of creation, the primal force from which all other numbers spring forth. Zero along with Number One signifies the supreme almighty. The year begins on a Sunday (which is perfectly compatible with the year number 1). · India is governed by number 1 and 9, according to its date of birth (which is perfectly compatible with number 1). 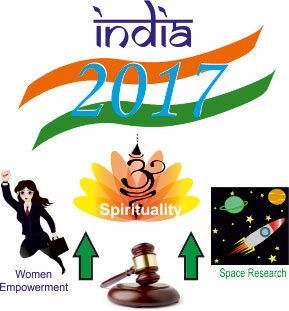 · In year 2017, India will be under the Annual Ruling of number 6. The ruling of number 6 is not considered very productive, but indicates sudden upheavals and changes accompanied with unrest among the masses. You need to be prepared for a major change. You will be inspired to start new projects or enterprises. Make plans; get the necessary support; but above all, rely on yourself as the driving force. Be decisive! There may be some emotional turmoil, especially in first three months. But the rest of the year will bring happy news for you. March, April, July, August and October are the key months this year. To enhance your prospects, you must wear a twelve mukhi and keep a pink colour handkerchief (especially on Thursday and Friday). This is a year to be organized and practical. There will be a sense of limitation and frustration, but it is a time of important opportunities that must be seized. It is good years to take care of projects, which have been postponed for too long. January and February will bring some important changes; as the year ends you will be satisfied to have passed out a tough year with bravery and enthusiasm. To enhance your prospects, you must wear a Sixteen mukhi rudraksha and wear white clothes on every Friday. This year you will find new opportunities coming your way. Things will finally work out. Long prolonged promotions and orders will be moved. You will see the light at the end of your financial tunnel and an inner strength and confidence will break out of you. This is your year of harvest. This year will undoubtedly turn out to be a satisfying one. To enhance your prospects, you must wear a Ruby Ganesha and use a brown handkerchief on Sunday and Thursday. This is a year of progress and financial advancement. Commit yourself entirely to your goals. This is a year of domestic responsibility and attention to family and friends. May will be a month filled with the promise and stress of imminent changes; September will bring advancements; December will bring a sense of completion and fulfillment. To enhance your prospects, you must wear a Thirteen mukhi rudraksha, Emerald Ganesha and wear blue clothes on every Saturday. This is not a year for social activities, nor is it a year to try to reach goals on a material level. Improve the quality of your life, read, contemplate, and gain personal insight. It is during this year that you strengthen the foundation of your life. It will be a pleasant year in all. To enhance your prospects, you must wear a White Coral Ganesha, Angarak Bhojpatra Yantra and carry a pink handkerchief. This is the year to finish up all unfinished business and make room for new things. On the material front, this is the best time to sell off your property and pay off all your debts. On the spiritual level, you will experience enlightenment coming in your life. Problems will be solved. Strained relations will relax or disappear. This is not going to be an easy year, but you will feel relieved and find yourself on the brink of a positive break. To enhance your prospects, you must wear a Garbh Gauri Rudraksha and use white or light shades of yellow during the second week of every month. This is a year of dynamic changes. Many surprises will come your way. You will have some unexpected adventures and lucky breaks this year. Special changes will be in April and May. Throw off the old and outmoded methods or characteristics. It is a year of rebirth and release after last year's struggle. To enhance your prospects, you must wear a Seventeen mukhi rudraksha and wear white clothes on every Sunday and Monday. It is a year to carefully protect and nurture your plans. You need to use tact and cooperation to keep yourself moving ahead. There will be confrontations with others, requiring a gentle and subtle approach. You will have to stay focused amidst all chaos and adversities. The year is marked by struggle, but at regular intervals you will get opportunities to advance your plans. May is the pivotal month this year. To enhance your prospects, you must wear a White Coral Ganesha & a sixteen mukhi rudraksha, and use yellow/ brown in your clothes. This is a year of personal growth and expansion. Creativity and artistic talents must be developed this year. You will meet new and exciting people. You will travel more than usual. February will bring changes, June will complete your pending projects; and July signals a new beginning. 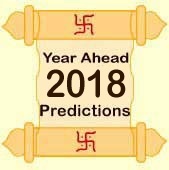 August and November will be emotional To enhance your prospects, you must wear a fifteen mukhi rudraksha and carry a green handkerchief.